I make no secret about the fact that I play Aracom Amps. I’ve played TONS of different amps, and though many tickle my fancy, I’d consider buying a very select few; actually there are only two other amps that I want besides another Aracom, and that is an original Fender ProSonic and a DV Mark Little 40. At this point in time, I have three Aracom amps: The PLX18-BB w/Trem, VRX18, and the VRX22. The PLX18 is Jeff Aragaki’s rendition of the venerable 18 Watt Marshall Plexi “Blues Breaker.” The VRX18 is a souped up version of the PLX18, with more modern circuitry, and it sports an extra gain stage so that its second channel is more aggressive. The VRX22 is the 6V6 version of the VRX18, though its second channel is even more aggressive than the VRX18. I use all three amps in both studio and stage, and I love ’em all. Each has a different character. But my VRX22 is hands-down my rock machine. While he had the amp, I asked him if he could adjust the second channel a bit. The last time I had him work on it, I asked to get a bit more gain out of the drive channel. Plus at the time, I had gotten a pair of nice 1959 RCA 6V6’s and had Jeff install them and he biased them a bit hot. The problem with my requests was that the distortion of the second channel was a little harsh, plus with that extra gain, I couldn’t get a clean tone out of the channel unless I turned the volume way down. So this time, I asked him to take the gain down a few notches. He also lowered the bias of the power tubes. When he was done, he called me up, and told me what he did, and in his very understated manner, told me that the amp was sounding pretty good. When Jeff says something like that, I know he’s worked some magic on my equipment. This time was no exception. I got the amp back this past Saturday, and finally got to play it for the first time in a couple of months last night. I was in the process of re-recording guitar parts on a song I wrote a few years ago, and was actually using the VRX18. But I wasn’t getting a tone that I wanted, as I needed more “oomph.” The VRX18 is pretty bright, and it has some great distortion, but I needed a “bigger” sound. So I plugged in the VRX22, and was absolutely shocked at how it sounded. The aggressiveness was still there in the second channel, but it was much more tame and smooth. But overall, the tone was incredibly FAT! OMG!!! Jeff did something that completely transformed the amp, and I practically had a religious experience. It sounded so much bigger than it had previously; almost scooped, but not in a high-gain metal way. Could it be that the power tubes were working optimally? Who knows? All I do know is that the VRX22 was totally inspiring me! I kind of got lost just noodling around, but I finally got down to the business of re-recording the guitar parts. At first, I was using my Les Paul ’58 Reissue, but that was just too fat. So I went with my Strat. After evaluating my takes, while I dug the Strat rhythm part, I wasn’t fully buying into the lead tone. So I went back to my R8. Then I realized that I had originally recorded the R8 on a predefined Logic track that had a lot of compression and rolled off the high EQ. So I created a raw track with no compression and EQ (though I did add a bit of compression – like 2.7 to 1 during mixdown). That made all the difference in the world as the those high-freq artifacts that I love were back. I still had to record the R8 doing rhythm part using the bridge pickup, but it definitely had the “oomph” for which I was looking. I replaced the right channel rhythm and the lead part with the R8. The left rhythm part is my Strat in the neck pickup plugged straight into the VRX22. Note that I didn’t use any effects save a touch of compression and some reverb in the channel strip. So the guitar sounds you hear are just the guitar plugged into the amp; no EQ. The natural fatness is amazing! 🙂 Also, the amp was plugged into my Aracom PRX150-Pro attenuator, and recorded at loud conversation levels, so there’s no speaker breakup adding to the tone. It’s all the amp. While Jeff Aragaki and Aracom are best known for the PRX150 attenuator line, more people are discovering just how gifted Jeff is with amps. The man’s a genius, and yet so very humble. I really am very lucky to have Jeff as a friend. 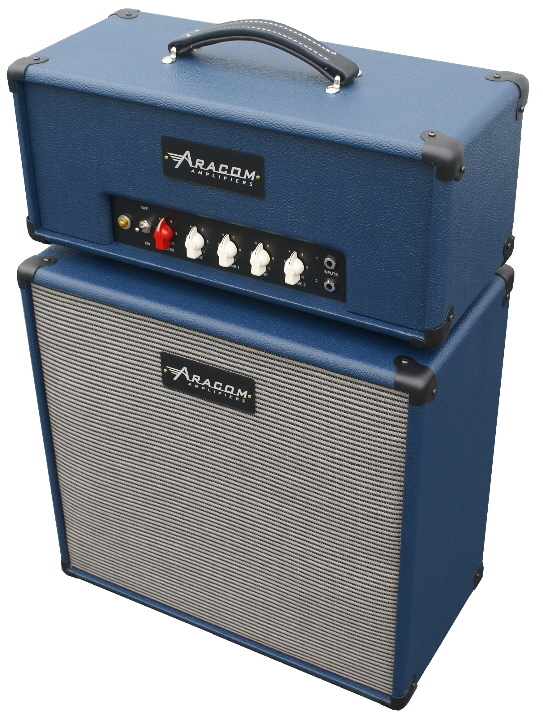 For more information on Aracom Amps, drop by Jeff’s web site. Jeff should build a KT-66 Plexi clone from the 60s. Funny you should say this. He just shipped a customized Evolver to a customer that has those very tubes. I only know this because I was picking up my amp at his shop. It sounded awesome! Hi, did you ever asked Jeff what was the magic mojo he did to the VRX22? I am been tempted to order the VRX22 thanks to your reviews, do you know if it is possible to have only one input and have a toggle swicth and a pedal to change between channel 1 and channel 2? That is exactly the mod Jeff made to mine. All you need to do is ask. 🙂 that amp will NOT disappoint!!! I can switch channels with both a toggle and a foot switch. Jeff can convert the second input into foot switch jack. Might cost a little extra but it is totally worth it. Why not give him a call? Also, in response to your first point, yes, I did ask Jeff about his “magic mojo” was, and it was actually pretty simple. Apparently, the original Marshall design had some “interesting” values (not that I understand any of the electronics) on some of the circuits that made the amp less efficient. Jeff fixed those. Also, the solid state rectifier with the voltage sag simulator is really awesome on that amp for some reason. He offered to replace it, but the amp sounds killer with it, so I told him not to bother. He did build me a VRX18 that had it, and it’s awesome as well, but I didn’t want to change a thing with the VRX22. Jeff makes great amps. I have a PLX Custom 50 (same as the 100 except 50W) with effects loop with bypass and 10dB pad,Channel switching with tube boost, supplied with 2 button footswitch, Master Volume, which can be disabled (On Plexi Channel) with a push/pull pot on the M.V. control and also the Hi/Low B+ output power.It has various tone shaping mini-switches as well. Its an absolutely fantastic amp housed in a “M”style late ’60s Big Box Head Cabinet. Jeff is currently in the process of making me another amp, a really special custom model using the PLX 100 as a basis for it. Its called the PLX Custom 100 Super HT. 100W, 3 channel amp(Non Channel Switching) with Switchable solid state rectifiers, 1 modern and one for vintage type sag. The three channels are: Super P.A. , Super Lead and JCM type Hi Gain. It has a few voicing switches and a three position channel disable switch to disable either the Super PA or JCM Channel to allow more gain in the Super Lead and what ever channel that hasn’t been disabled. No Effects loop this time and no Half Power switch, though Jeff advised me that the VTS (Vintage Tube Simulation) Rectifier will allow the amp to break-up uinto distortion earlier than the MSS (Modern Solid State) rectifier. The actual appearance of the amp will be a bit similar to a late ’60’s Marshall Super PA head. This is a fully custom amp with special plexi panels that are wider than the standard ones used. The cutout for the control panell is approximately 23″compared with 16.5 ” on a Superlead amp. Damn! That sounds like a KILLER amp! Jeff is definitely a genius when it comes to stuff like this. The guy continues to amaze me with the stuff he builds. Though he’s gotten most of his attention from the attenuator lines, his amps are nothing short of spectacular.